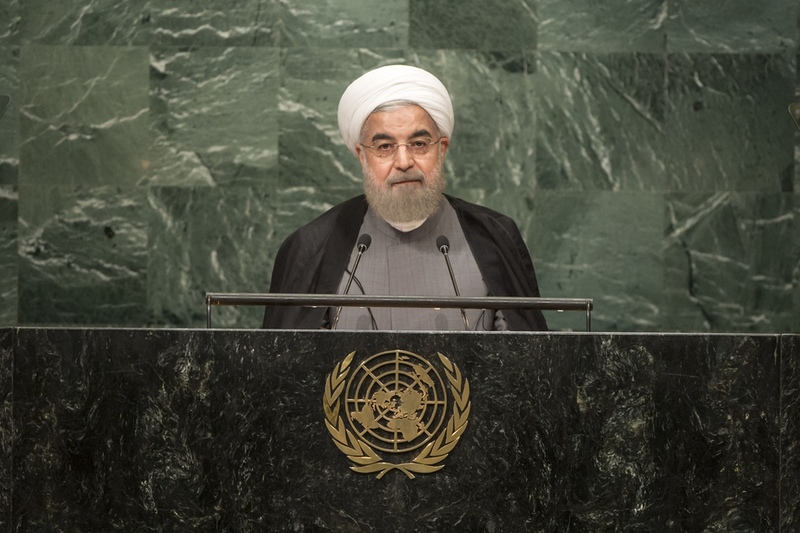 HASSAN ROUHANI, President of Iran, recalled that the war in Iraq had sown the seeds of the borderless terrorism which had spread across the world. The question of why the world was facing such a problem should be on the agenda of international forums. “The genesis of borderless violent extremism and terrorism could be attributed to the security strategies developed by major Powers in the past 15 years,” he said, adding that security in one region at the cost of insecurity in other was impossible; it could lead to more insecurity everywhere. It was regrettable that “some Powers” had provided covert and overt support for Takfiri groups or had condoned their formation, he said, adding that such Powers were now committing atrocities against innocent people and their defenders “under the guise of fighting terrorism”. In particular, the Saudi Government must cease and desist from divisive policies, spreading hate and hateful ideology and trampling upon the rights of its neighbours. His Government opposed any kind of sectarianism, he went on to say. Muslims, whether they be Sunni or Shi’a, had lived in harmony for centuries and would continue to do so. He affirmed his country’s commitment to prevent a dismemberment of the region, recalling such a situation which had occurred a century ago. Finally, he expressed his concerns about the implementation of the Joint Comprehensive Plan of Action, which his country had reached with the P5+1 [China, France, Russian Federation, United Kingdom, United States and Germany]. While the Plan of Action offered a model of the success that could be achieved through constructive interaction and dialogue, the United States had not met all of its commitments under the agreement. That failure would erode the United States’ credibility in the world and should be rectified immediately. Furthermore, he condemned recent measures by the United States Supreme Court to seize billions of dollars of Iranian assets. Finally, he celebrated Iranian economic progress and predicted that Iran’s economic growth would reach approximately 5 per cent by the end of 2016. He also spoke about the claims made against Iran’s territorial integrity. His country had full sovereignty over the Persian Gulf islands of Abu Musa, Greater Tunb and Lesser Tunb, and he rejected categorically any claim to the contrary. His Government stood ready to resolve any misunderstandings with the United Arab Emirates. Iran’s territorial integrity and sovereignty over those islands was non-negotiable. The representative of Iran said the United Arab Emirates had reported baseless fabrications – also levelled on other occasions – but had made no effort to substantiate them. It was absurd for a country whose jet fighters were bombing innocent civilians in Yemen to accuse Iran of interference in other countries’ affairs, and similarly absurd for a country exporting ideologies and arming terrorists in Iraq and Syria to accuse Iran of destabilizing the region. Iran had always rejected the Emirati representative’s falsehood about the three islands, which were and would always be part of Iran’s territory. Taking the statements by the United Arab Emirates and Israel together demonstrated that those two regimes were coming together, he said, adding that the Emirati view of partners in the Gulf was coalescing with the Israeli view, which was a betrayal of the Palestinian people. The United Arab Emirates and some of its partners had tried to impede the road to the Joint Comprehensive Plan of Action to no avail. He went on to say that Bahrain’s representative had also made a false claim about Iran’s interference in domestic affairs, noting that the report of the Bahrain Independent Commission of Inquiry on Iran’s involvement in its internal matters had not established a discernible link. Referring to the disaster in Mina, Saudi Arabia, he said Iran had expected that country to adopt a responsible approach when almost 500 Iranians had been killed, but that had not happened. Any findings by local investigations of the tragedy, if any, were yet to be released. Noting that a few speakers had used false and incorrect terms to denote the Persian Gulf, he said that had been the traditional term and correct appellation for that body of water since 500 B.C. It was also the standardized geographic term recognized by the international community, including the United Nations, and should not be “tinkered with” according to the wishes of particular rulers, he emphasized.